Most states do not collect data on the number of students being homeschooled; this makes determining the exact number of homeschooled children impossible. We can, however, make estimates. The most accurate estimates we have are those released every four years by the National Center for Education Statistics (NCES), which includes questions about homeschooling in its National Household Education Survey, last conducted in 2015-2016. The number of children being homeschooled grew 28.9% between 1999 and 2003, 37.6% between 2003 and 2007, and 17.4% between 2007 and 2011-2012. Between 2011-2012 and 2015-2016, the number of children being homeschooled deceased by 4.5%. The highest rate of homeschool growth occurred between 2003 and 2007. 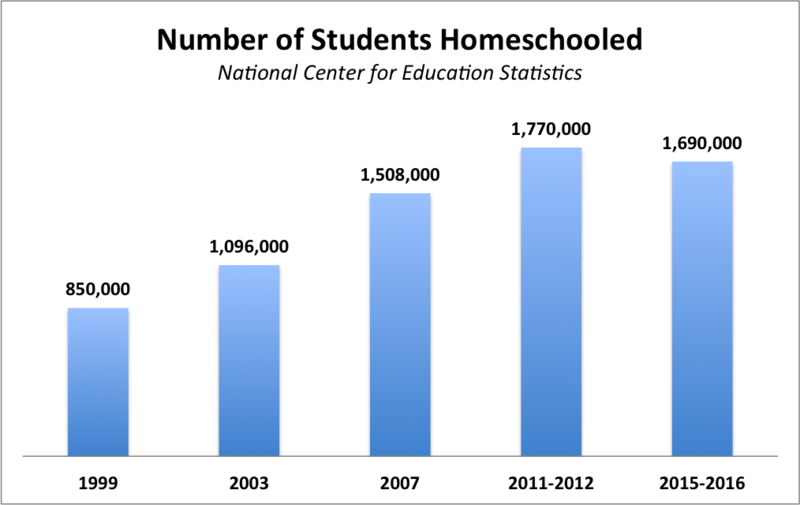 While homeschooling grew rapidly between 1999 and 2007, in other words, that growth slowed between 2007 and 2011-2012. Between 2011-2012 and 2015-2016, the estimated number of children being homeschooled decreased by around 80,000. As of 2015-2016, around 1,690,000 children, or 3.3% of all school aged children, were being homeschooled. While the early 2000s saw explosive growth, the rate of homeschooling appears to have stabilized since 2010. For data from 1999, 2003, and 2007, see this table or this report. For data from 2011-2012 and 2015-2016, see table 7 in this report and table 7 in this report. Eleven states do not require homeschooling parents to notify anyone that they are homeschooling. States that require parents notify education officials frequently do not collect this data at the state level. Some states track the number of homeschools rather than the number of homeschooled students. States that require parents to notify the state only when they begin to homeschool may have defunct homeschools on their rolls. There is some disagreement as to whether students educated at home through private “umbrella” schools or virtual charter programs are homeschooled. The table below provides (1) unadjusted estimates of the number of children homeschooled in each state, (2) adjusted estimates, and (3) state data where available. 1. We created the unadjusted number for each state by multiplying the number of children ages 5-17 in the state by 3.3%, the nationwide homeschool rate. The unadjusted rate, then, shows how many students would be homeschooled in that state if children in that state were homeschooled at the same rate as children are nationwide. Each state’s urban/rural makeup (more children in rural areas are homeschooled). The race or ethnicity of children in the state (white and Hispanic children are more likely to be homeschooled while black are less likely to be so). Each state’s child poverty rate (children below the poverty rate are more likely to be homeschooled than other children). It is important to remember that many states have characteristics that are not so easily corrected for. For example, enrollment levels in Alaska’s many correspondence school programs suggest that the state has far more homeschooled students than accounted for in our adjusted rate; this is likely due to extenuating factors specific to the state, such as the many students living in remote areas that are difficult to reach. 3. We gathered the state data listed in the table from the International Center for Home Education Research (ICHER); you can view this data on their website here. ICHER obtained this data from state education officials in states where such records are kept. Because this data is frequently not straightforward, we make liberal use of footnotes to provide more context. Unless otherwise marked, this data is from 2015 or 2016. Alaska does not require homeschooling parents to give notice to the state. However, it is estimated that the majority of Alaska’s homeschooled students are enrolled in the state’s popular correspondence school programs (the number provided here). In most cases these programs do not offer their own curricula; instead, parents homeschool independently, enrolling their children in the state’s correspondence programs in order to access the funding these programs offer for tutoring and other educational needs. It is almost impossible for the number of students being homeschooled in Colorado to be this low. This number, obtained from the Colorado Department of Education, likely reflects only students who register with local school districts as homeschoolers and not those who avoid this requirement by enrolling their children in “independent schools.” In some cases, homeschool support groups have created their own “independent schools” for the expressed purpose of ensuring that their members need not register with the state. The most recent number ICHER lists from 2012. Their notes state that the state stopped collecting enrollment data after that year. It is curious, however, that the state was able to collect such data at all. Connecticut does not require parents to notify local education officials when they begin homeschooling. As a result, the numbers the state collected from local school districts were almost certainly a sever undercount. This number does not include children homeschooled through private “umbrella” school programs. These programs were created in the 1980s, before the state had a homeschool law, as a legal means for homeschooling. After the state created its homeschool law, allowing parents to register through their local school districts, some parents preferred to continue homeschooling through the existing umbrella programs. Some of these programs, which were typically founded by homeschooling parents, offer classes and enrichment activities. Something strange is going on with Georgia’s enrollment data. The state saw a steady increase in homeschooling over first decade of this century, with 42,474 students homeschooled in 2010. The state did not report enrollment data in 2011 or 2012, and then offered a series of wildly fluctuating numbers: 18,064 in 2013; 62,582 in 2014; 58,806 in 2015; and 31,527 in 2016. This clearly cannot be correct. The state changed its reporting requirements in 2013. Perhaps these wild fluctuations reflect confusion stemming from this change. North Carolina is an outlier among the states for which we have data; in no other state do education officials offer homeschooling numbers so dramatically higher than what we would expect given the national rate of homeschooling estimated by the NCES. This high enrollment has not gone unnoticed; in 2014, some news sources speculated that North Carolina’s jump in homeschool enrollment might be a sign that homeschooling was increasing dramatically nationwide as parents voiced their opposition to the Common Core. The latest NCES data suggests that this was not the case; the NCES estimates that the nationwide rate of homeschooling has actually declined. What explains North Carolina’s high enrollment? The state requires parents to register with the Division of Non-Public Education only when beginning to homeschool, rather than annually, and does not ask for individual students’ names or grade levels; as a result, there may be defunct homeschools still on the books. This number does not include students homeschooled under the state’s religious exemption, rather than through the state’s homeschool law. In the 2015-2016 school year, 6,472 students were homeschooled through the religious exemption, which allows parents to bypass all state requirements and standards, bringing the total number of students homeschooled in the state that year to 39,887.